Essential Thrombocythemia is a very rare disorder in which the body produces too many blood platelets which result in feeling of fatigue and lightheaded. This condition also increases the risk of blood clots. This condition is more common in people which are over 50 years but younger people can develop this disorder too. This is more common in women as compared to men. It is a chronic form of a disorder. Certain medicines are available that lowers the platelet count and blood thinners are available. WHAT ARE THE SYMPTOMS OF ESSENTIAL THROMBOCYTHEMIA? There is not any noticeable symptom of essential thrombocytopenia. The first indication is the development of a blood clot which can develop anywhere in the body but with essential thrombocythemia, they occur most often in the brain, hands and feet. Redness, throbbing or burning pain in the hands and feet. If the blood clot occurs in the artery that supply blood to the brain, it may cause a Transient Ischemic Attack (TIA) or stroke. Weakness or numbness usually on one side of the body. WHAT ARE THE CAUSES OF ESSENTIAL THROMBOCYTHEMIA? It is a type of chronic myeloproliferative disorder. The bone marrow, spongy tissue inside the bones makes too many of certain type of cells. In the case of essential thrombocythemia, bone marrow makes too many cells that create platelets. A normal platelet count ranges from 1,50,000 – 4,50,000 platelets per microliter of blood. In essential thrombocythemia, there are 4,50,000 platelets per microliter of blood. As a result, the excess platelets may not function normally leading to an abnormal clotting or bleeding. If the blood count is above 4,50,000 platelets/microliter of blood. Blood tests will confirm the number of platelets, the size of platelets, activity of the platelets, iron levels, specific genetic flaws, markers of inflammation. Manjishtha Capsules of Planet Ayurveda are prepared from the standardized extract of the herb Rubia cordifolia. It is best known for blood purification since ages. It contains salicylates and triterpenoids substances that alleviate swelling or inflammation. This herb is also useful in boosting immunity. This herb is useful in all types of blood disorders therefore it is quite effective in the treatment of Essential Thrombocythemia. Liver is the most important organ of the human body as liver checks and examines everything and allows only the good molecules to enter the body via blood. The bacteria, viruses, drugs, preservatives, pollutants etc. struggle in the liver to get through the main blood stream. So, if liver is healthy, there are less chances of any blood disease. So, liver detox capsules are very helpful in the treatment of essential thrombocythemia. 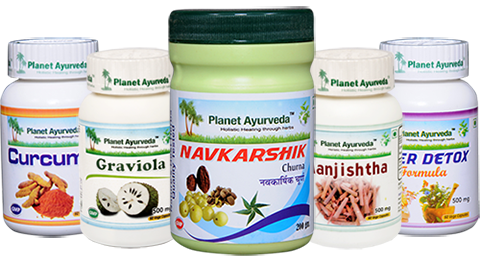 Navkarshik Churna is a classical Ayurvedic formulation particularly recommended for blood purification, correcting the liver metabolism. It is a blend of various herbs with wonderful properties such as detoxification, correcting the Pitta metabolism, improving immunity, anti-inflammatory properties. Dose: 1 teaspoonful twice daily. 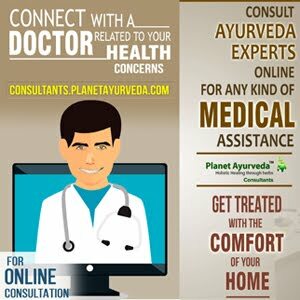 Curcumin Capsules of Planet Ayurveda are prepared from the standardized extract of the herb Curcuma longa. It is one of the most ancient herbs used in medical sciences. Owing to its rich medicinal properties, it is a component of various remedies. It is rich in anti-oxidants and possesses anti-inflammatory properties as well. This herb has the power to fight against toxins and infections owing to its rich anti-biotic properties. It is useful in blood purification as well. Graviola Capsules of Planet Ayurveda are prepared from the herbal extract Annona muricata. Every part of this plant whether leaves, bark and fruit possess medicinal properties. It is a natural agent comprising of anti-viral, anti-bacterial, anti-oxidant, anti-tumor properties which bring so much relief to the patients suffering from various diseases. The stem, bark and leaves of this herb are rich I various anti-oxidants such as coenzyme Q10 that can fight inflammation, remove free radical formation and ensure the functioning of the body at an optimum level. It also promotes the feeling of rejuvenation. Eat healthy foods such as whole grains, vegetables and fruits. Avoid trans fats. Increase physical activity for at least 30 minutes a day. Maintain weight as being over-weight increases the risk of blood clots.